Awww sorry guys. It's time to bring the sucker home for repairs then. The tour will go on! but if anyone wants out, I'd understand...haha. Technical issues aside, I was really surprised by how much I like these shorter throw switches. Jailhouse Blues ROCK! One of you hired guns for modding should figure out a standard price and there might be quite a bit of work for you. Just dropped of the board to ship back to Khaangaaroo via Priority Mail. Still working on the review and hope to post it soon with photos. I'll you guys know once I figure out what's wrong with it. I'm adding Photoelectric to the mix and moving Mugen back up, assuming he'll be back from his trip once the board is ready to head back out. Check the updated list for the new order. Thank you--I'm extremely intrigued. I tried MX Clears and Ergo Clears today, and I really liked them. These Jailhouse Blues sound even potentially better. Over tightening of the screw on the bottom can somehow cause keys in row 4 to go out. I should have paid more attention to mashby's video about which keys weren't working and connected the dots. I open my QFR's up pretty often, so I never bother to keep the screw in. But I reinstalled the screw right before starting the tour, thinking it would help keep the board more rigid during shipping, so it eventually caused problems. I'll leave the screw out when I continue the tour. But I'm glad we got the board home for a pit stop. I replaced the bad F4 switch, and put tighter spacers in the keys that were still making a slight click (phx mentioned in his review.) Man, I forgot how time consuming it was to mod regular blues into JH Blues...haha. I'll test the board out some more tomorrow to make sure everything works before sending it out again. Thanks for your patience, guys! Glad it wasn't anything major! Jailhouse blues are wicked bad. So bad they are..... good? Glad it was a relatively easy fix! Looking forward to trying the switches! Ok, it's heading out again. If you guys could reuse the original packaging and pack it the same way, I'd appreciate it. I also included some blank shipping labels. The old one should peel off easily. Awesome! I've got some nice light soft white "cloth" that my IKEA Expedit shelving was wrapped into to wrap the keyboard into as well, under bubble wrap (if that's what you're using). Am I next in line? And is it ok if I just write out the address since I don't have a printer? I can't wait till its my turn, thanks for putting me on the list Khaangaaroo! CPTBadAss: There's an up-to-date list in the first post--you'll be the 3rd person on the way, I believe. I don't have a printer either, but I either print at work, or at Staples (across the street, they offer 10c a page black and white printing--very convenient for quick USPS / UPS labels). It's cheaper to pre-pay USPS Priority on-line and print out a label somewhere, if it's not too inconvenient, but you can always write out labels by hand, of course! I just have it in the original QFR box. But I have bubble wrap and a foam sheet cut to size so that the QFR box doesn't shift around inside the Amazon box. It was in a larger box before, and the QFR box was starting to rip at the corners from all the tumbling around. You'll be after Photoelectric and Mugen. 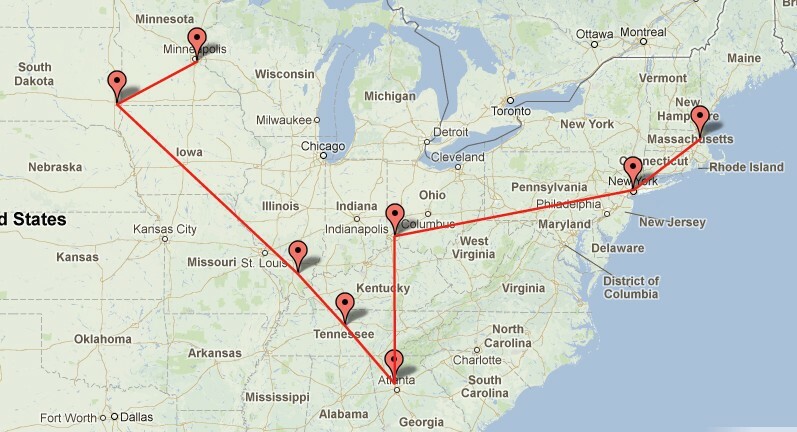 I changed the order cause Photoelectic is farther east, and Mugen should be back from his trip. 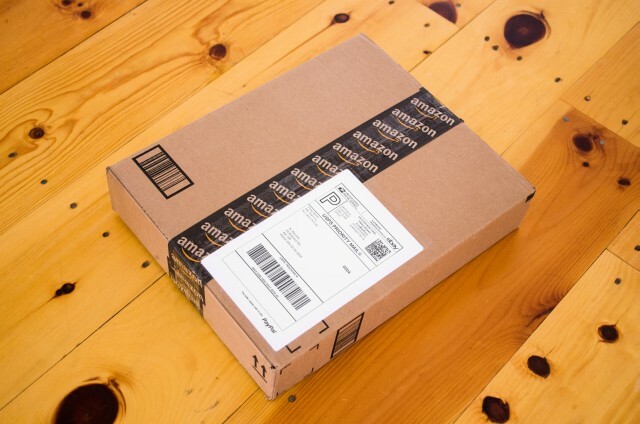 Yeah, you can just write the address on a blank shipping label. Yeah, you were closest geographically to mashby, but because the board came back to me on the west coast, it's cheaper for everyone overall if I start it out again in Massachusetts. The bump is bigger than a brown stem, and closer to the top of key travel. The reduced travel distance comes from the white half of the stem extending lower than regular mx keys and hitting the bottom of the switch housing sooner. 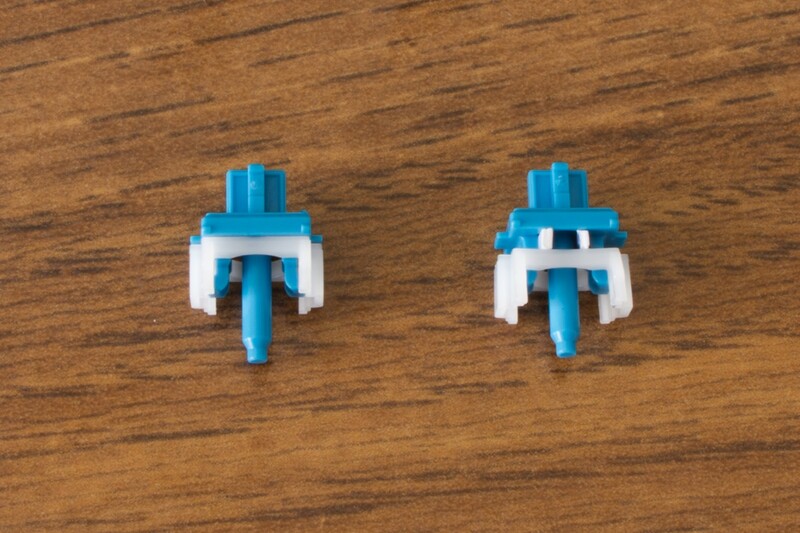 The bottoming out sound is muted because instead of the sound of impact going directly from the stem to the key cap, it goes from the white part of the stem > spacer > blue part of the stem > key cap. Man, I forgot how time consuming it was to mod regular blues into JH Blues...haha. That is one very big downside to them. I was lucky in that I developed them and the spring tensions on a board without a plate, got them all working and tested, before putting them into a Filco. I would have gone insane and more than likely destroyed the board before I finished them had I needed to unsolder every time I changed something. Good to know this is back underway! Also cool pics! Some of you workbench jockeys need to come up with a standard price for doing this. These are HIGHLY DESIRABLE switches, and I dislike blues! Other than possibly having to de-solder, it's not a difficult process, just fickle and time consuming. I may have found a MUCH easier way to do this though, I will do some testing tonight. I got the keyboard safe and unharmed! Just opened it up and started testing it. 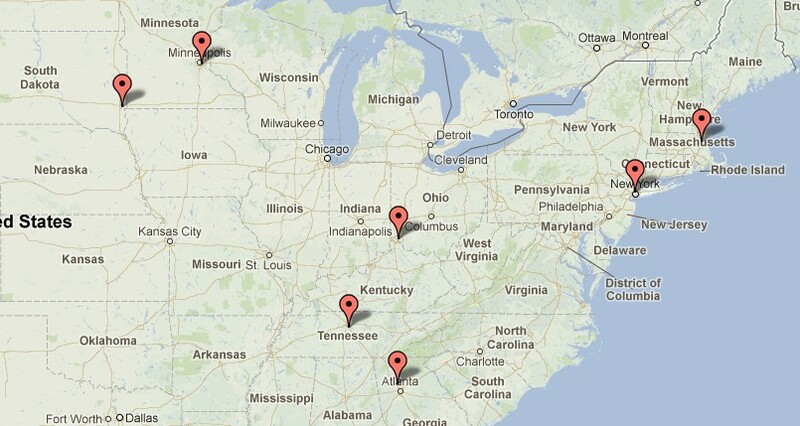 No issues that I can detect yet. I'll write a review later, but my first impression is: wow, the short travel distance makes for a very different typing experience vs other MX switches I've tried so far! I tried to print out clips to do the JB mod, but so far, they have yet to function. It's such a small part and accuracy needs to be quite high. Hopefully, I can get it right at some point. Wouldn't little "U" shaped pieces of just the right wire, which could be crimped a bit to stay in place, be easiest and most reliable? The problem with that is that the right size wire is too thick as it passes the spring, so the spring catches and makes the switch feel notchy and inconsistent. The way we have been doing it was to push the spring down, it stiffens it, but at least it's consistent. In my case, I then trimmed the springs down to lower the spring rate back to normal after. If I can get the clips to print properly, they would just snap on, and would clear the spring entirely. So far, I haven't been able to get the accuracy high enough. Ah they look rough so I thought they might be. I like them! Those clips sound like they would make this very simple and easy enough for anyone. If there is any costs involved in developing them that I could help with shoot me a PM. Thanks, it's ust a matter of getting the printer setup right... I think. The clips themselves are easy enough, I already have the files, so once I can get them to print good, I can print them 60 at a time or something. 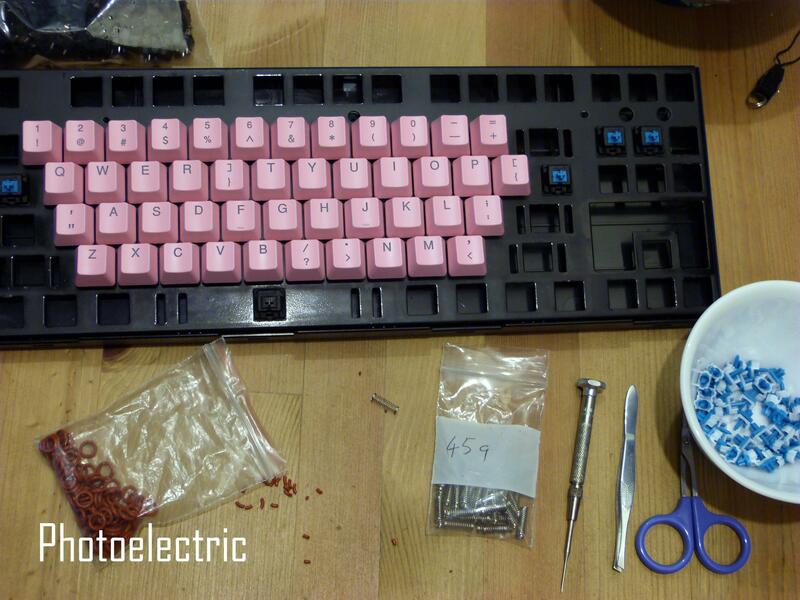 They use so little plastic, a 2 pound roll would probably last for 500 keyboards. Well if I can help in anyway let me know! I have some blue switches coming soon! I'll add my typing impressions tonight or tomorrow and will try to do a sound recording of how the switches sound vs Browns, Clears, and MX Black). However, if it was really aged copper, it would be green. It's the name of the paint, but yeah... I have some pure copper pipe holder things, and in comparison, this color is darker and more brown. This color changes a lot depending on lighting. I would be very interested in this. I have sorely missed that tour keyboard. I was already planning on turning my KBT Pure with MX-Blues into Ghetto Greens, but I've decided I find the pitch of the click just too irritating. So I'm thinking of making them Jailhouse Ghetto Greens, or is it Ghetto Jailhouse? 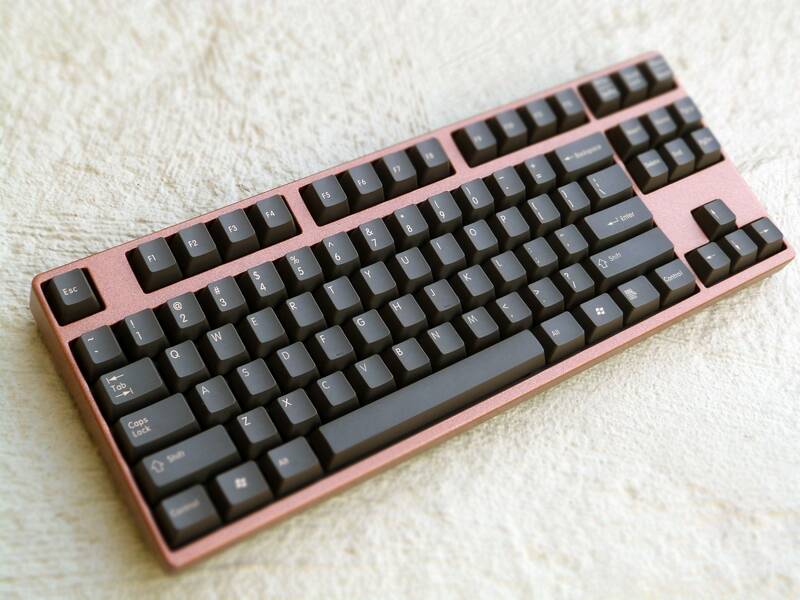 Regardless, I'm not in any rush because I'll be waiting until I get my Pure plate from the GH60 group buy, but if you get some created, I'd love to buy a set from you. As a quick note, this magical keyboard has gotten a face-lift in the form of case paint. Woah, that is completely unexpected and looks amazing! Just remind me, no sanding or anything just spraying it down right? I sanded ALL the corners and bent surfaces free of the rubberized gunmetal coating, and all the flat surfaces were sanded too, but not all the way through. The gunmetal QFR cover has a very thin coat of some rubbery material that carries the paint color over plain black plastic. I wasn't sure how durable oil enamel would be over the rubberized coating, so I started sanding with 600-grit sandpaper, and it basically took zero effort to get the coating off any corners. The coating is very very thin. Then I used Rust-Oleum Universal paint and primer in Aged Copper on this case, because the color is so awesome. Normally I don't use paint+primer and just use straight enamel paint and maybe a thin layer of dedicated plastic primer underneath, as a lot of Rust-Oleum's paint sticks to plastic really well already. Not sure if I'd recommend their Universal line yet or not, as it took a lot longer to dry vs other paint lines I've used so far, so basically need to be super careful and not handle it for a couple days after painting. I could still make a fingerprint indent on the paint with some heavy pressure 24 hours after painting! So for ease of use, I'd recommend other paint lines, like the Painter's Touch. But this line does have some sweet colors to choose from Lately I like DupliColor Metal Specks paints over a thin layer of Rust-Oleum, and then clear-coated. Typing up my review for this keyboard now!! First of all, thank you, khaangaaroo, for the opportunity to play with this super cool keyboard!!! The keyboard itself was quite a surprise! The short key travel distance really makes the switches feel differently from other MX Switches I've tried. It's almost like having a stack of o-rings on every key, but of course, different, because the tactile bump is very close to the top. I thought it would be more like a rubber dome keyboard in a way, because the the tactile bump being higher up, but... it's not. It's tougher and snappier than rubber domes but has a thicker and heavier feel than clean, crisp, and lighter normal MX Blues. The sound from the keyboard is dampened, and some switches still make a faint clicking sound--many don't. The hint of a click is there with most keys when typing. When I first tried the switches, after unpacking and plugging in the keyboard, it felt like the keys were fighting my fingers. The travel distance was short, and the rebound was quick (springs are at higher tension, because they are slightly compressed), and I felt like my hands were getting a workout--like hitting a light punching bag made for fingers. But, as it happens, I got used to that sensation, though I still think that slightly lighter springs would be beneficial for me personally. These are not like MX Clears. The toughness is maybe similar, but imagine Clears with a very quick snappy bump close to the top of the travel and also a couple of o-rings. That would maybe be Jailhouse Blues on these keyboard. It's almost impossible to not bottom out or be close to bottoming out, because the force required to overcome the bump + short travel distance make it difficult to stop. For the video above, I typed slower and tried to avoid bottoming out. The keycaps are made of thin PBT, and the sound overall is muted, thumpy, and not terribly quiet. I can type more quietly on MX Browns by softly touch-typing, but the sound signature is quite different anyway. But the difference in feel between MX Browns and Jailhouse Blues is immense. My main 2 keyboards have MX Browns, and typing on Browns feels like typing on buttered switches after Jailhouse Blues--much less of a workout from lighter actuation and longer travel distance. 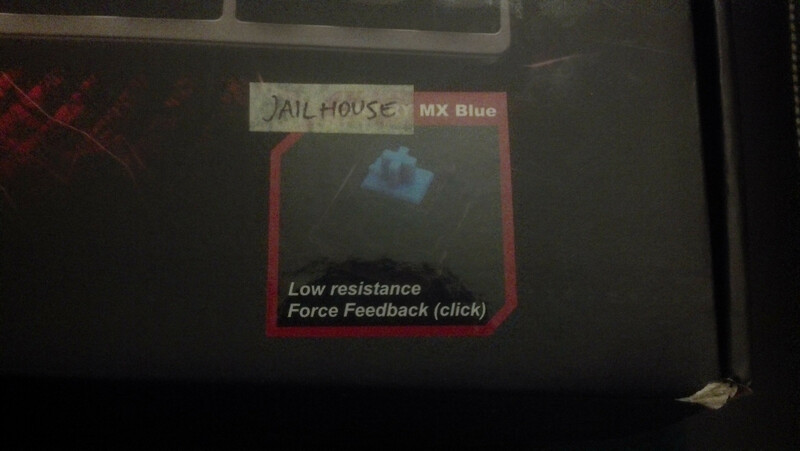 For reference, here is MX Browns (on a Filco, caps are from Ducky Shine) vs Jailhouse Blues (QFR). You can see how muted Jailhouse Blues sound--and I actually have very thin silicone o-rings on that Filco. Camera mic is approximately the same distance from both keyboards. May I be the second list for UK tour if it's going o happen? Considering I advocate cutting the springs (at least until when/if I get clips made), spring rates are kind of irrelevant. Them being so unique kind of makes deciding what is what a bit difficult. If/when I get clips working, I will let people know, I think more than few are interested. It's tougher and snappier than rubber domes but has a thicker and heavier feel than clean, crisp, and lighter normal MX Blues. The sound from the keyboard is dampened, and some switches still make a faint clicking sound--many don't. The hint of a click is there with most keys when typing. This is why I advocate cutting the springs, you don't really get the intended feel with super stiff springs. That stiffness, as you found, makes it hard to control. As for not all clicking, that has to do with the switch tolerances. I had to mix and match a few to get mine to all work properly. The last batch of clears I got, I found 3 or 5% didn't click on those either. Clears are supposed to click? o.o I know my 4 test Clear switches have a bit of a clanky clicky sound, but it's not the same click of MX Blues or Jailhouse Blues. I thought only Blues/Whites/Greens are clicky. I've been thinking: why not just use lighter springs instead of cutting the existing springs? Something like 55g Korean springs, or maybe even 45g? Clears click, they have a larger tactile bump than browns or blues. The jailhouse mod ramps up spring pressured by 30 grams. 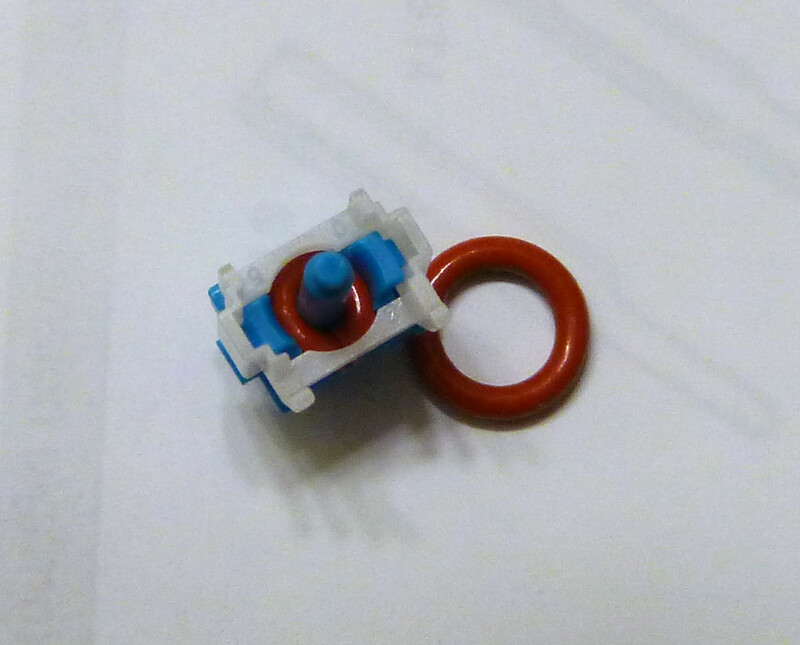 Unless you find something like a 30gram spring, you won't get close to a stock light Cherry spring. Thank you for clarifying the Clears--I was very confused why mine sounded clicky and why people called their Ergo Clears quiet. I made this sound recording recently to demonstrate how clicky/clanky MX Clears are, and they are far from quiet. There's periodic sound of keys resetting, which I think is due to the keycap. Hence why even MX Black has that sound. In the tutorial (which I may re-write soon) I mention how to achieve standard spring rates, and if you place the cut end down, has no detrimental effects. If you plan on buying springs anyhow, you may as well cut them and save the money. The board came safe and sound. Typing on it now. I'll have a review up later this week. Also, TheBinary is next in line and I can drop it off to him in person. I hope you don't mind me doing a handoff like that khaangaarroo. Edit: Someone also has incredibly nice handwriting. Who wrote these sticky notes? A handoff is cool by me. Yeah I think gluing the 2 pieces together has been brought up a number of times. But it won't leave room for adjustments if you glue them slightly differently from switch to switch. You'll probably notice some difference when you mount them, but you won't be able to change them easily. Wire or plastic, for example, allow you to redo and adjust your modification. Glue was my first foray into this, it was a disaster pretty much. The o-ring and credit card method is intriguing, but I honestly still think wire or solder is the most consistent method so far. It's cheap ($1.50 from Walmart), easy to fix mistakes, and faster than people think. 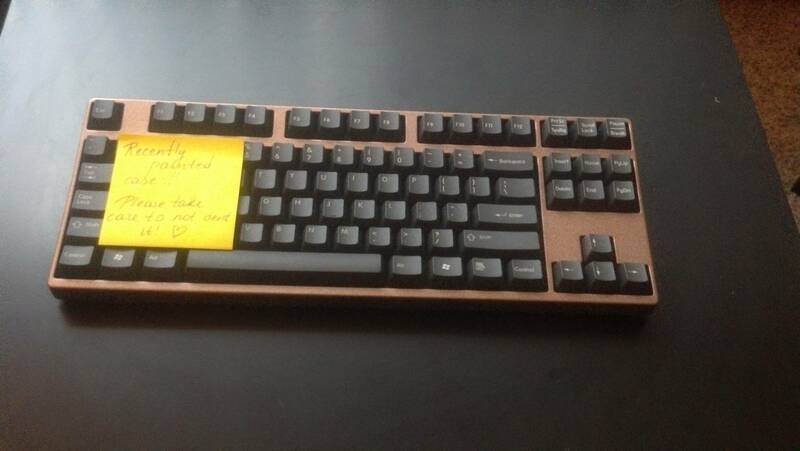 Saw this thread on Deskthority today. Jmneuv used a hole punch to create a plug to insert into the bottom of the of the switch housing and immediately thought of this thread. Jmneuv's goal was to replicate the experience of O-Rings, but given that it makes the throw shorter, I thought it might be of interest. Granted, this method doesn't remove the click, but it might spawn some other ideas from you clever hackers. GAH! If I had seen this I would've hopped in right after PHX! I'm just down in RI. Oh well. That will shorten the overall travel, just like o-rings, but it doesn't raise/shorten the actuation point which is the goal of Jailhouse Blues. 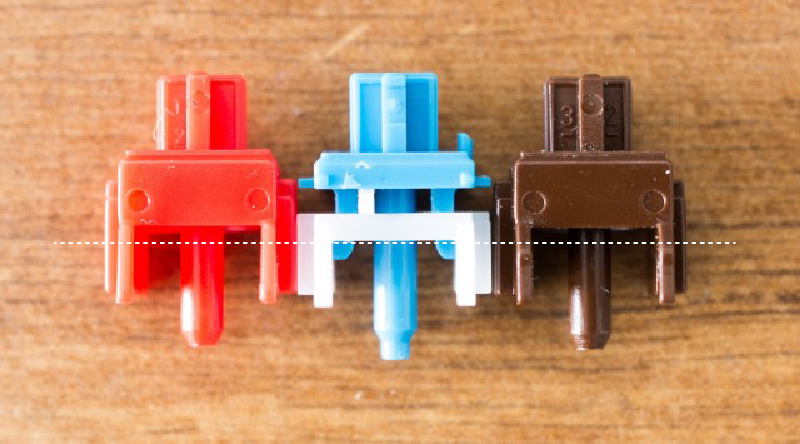 On the other hand, it is a great way to get o-rings for SP keysets or people who change keycaps a lot and use o-rings, as you wouldn't need to fiddle with them each time. im pretty sure the activation stays the same.... have you had the board yet? I'm in the process of making JBs out of my Filco's Blues. One thing I've noticed when using o-rings is that you can make 2 types of JBs: clicky and non-clicky. 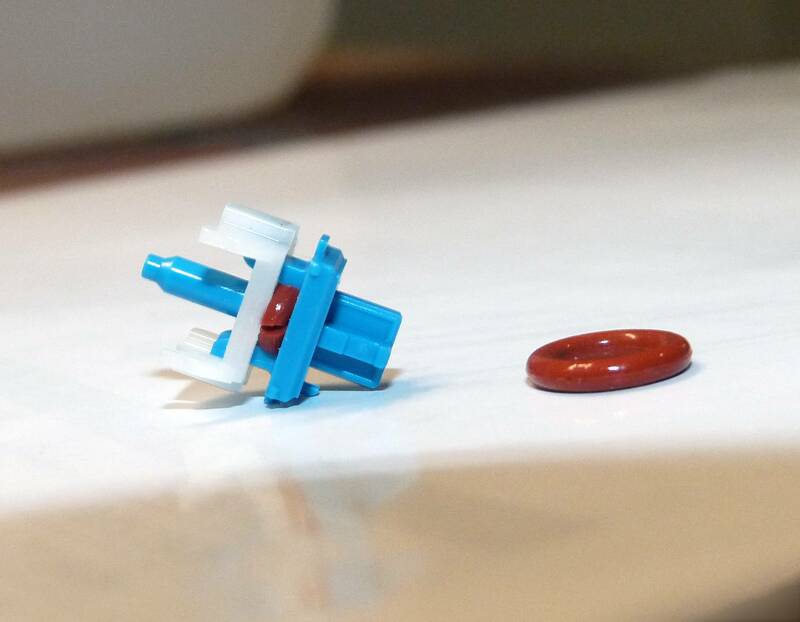 If you hide the entire cut of o-ring around the stem closely, the white piece and blue piece can move with respect to each other, and a strong click remains (but action is still shortened). If you keep the o-ring sticking out on both sides, between the white and the blue parts, the click is nonexistent and the action is the shortest. I decided to go with the latter. The o-ring can only stick out up to the vertical boundaries of the stem, as any farther, and it will rub against the housing and make the switch mushy. Not sure how many switches you've modded but are you seeing good consistency with o-rings? 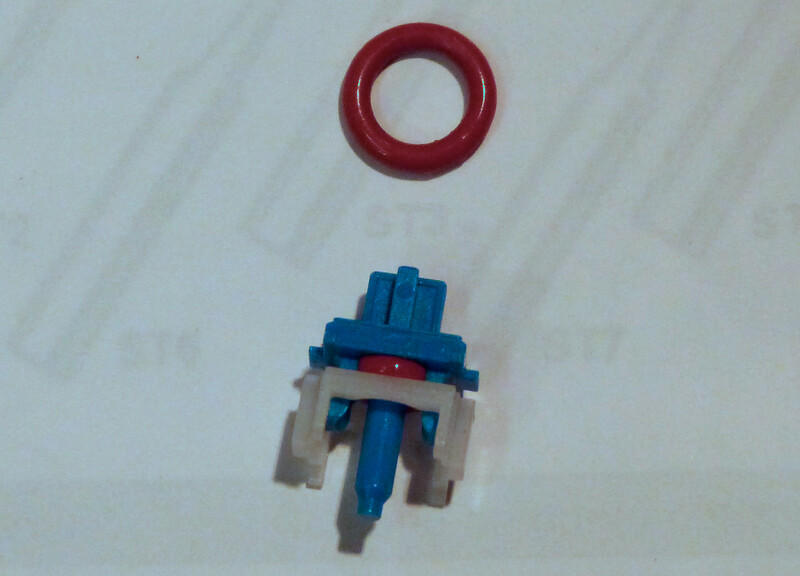 As long as I tuck in the o-ring pieces to stay within the vertical boundaries of the stem--yes. If I'm not careful and leave too much sticking out, that switch becomes mushy. Is there anything holding the cut O-rings in place, long-term? No, they fit tightly. They won't just magically slip out. I have to jam them in with a mini screwdriver. Once you put the switch back together, the housing encloses the stem. 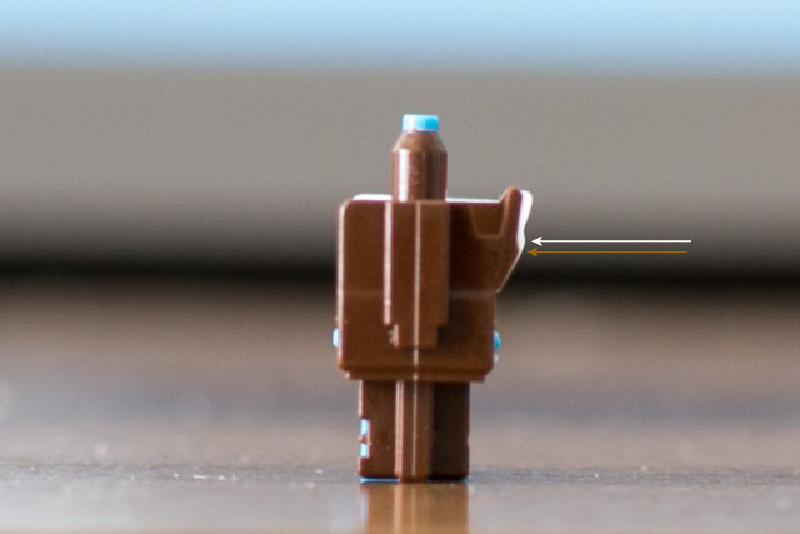 So even tiny, free-floating spacers won't fall out. That's the tiniest of my set, and I couldn't have done this without it. It's also been a lifesaver in countless cases (had this set for many years now). So I've been cutting an o-ring in half, pulling it through the stem, snipping off the remnant. Then combining 2 remnants to do every 3rd switch. Tweezers are also essential there. It's definitely a tediously slow process, but I like the cushiony result. It's MUCH easier to achieve clicky decreased action Blues than non-clicky short-action Blues, because for non-clicky, I have to keep enough of the o-ring jammed between the sides of the stem--without sticking out. For clicky, just get the o-ring tighly wrapped around the central "rod" part of the stem, and done. Please add me to the list. I am in California. Really? What are your Cherries of Choice, otherwise? Stock blues and reds are my normal preferences. The best mod I've found so far is 62g lubed blacks (I have these on my daily driver). I'm not a huge fan of ergo clears, though I'd like to try 62g clears. For what it's worth, my 45g spring JBs are different from the stock spring JBs I tried on this keyboard. Probably like ergo-Clears are different from stock Clears. (Also, I have 62g Clears and have mixed feelings about them. Somehow they don't feel as "solidly designed" as other Cherry switches to me). Is it too late to jump on this tour? I'd love to get to try these out. Shipping to me is considered CONUS by USPS, and you're shipping it to California in reality, where the army takes it the rest of the way, but since it's about an extra week to me, and back from me, I have no problem sitting at the end of the list, even if more people jump on the tour. i would like to +1 my name to the tour if possible, i've a blue qfr that i'm thinking of JH'ing, just not sure if I'm gonna like the end result for all the work. Forgot to post here that I passed the QFR to gameaholic on Friday. Cool, thanks for letting me know, hashbaz. For those still interested in trying the board but weren't able to get in this round, I'll take note for a possible second round in the future. My department at work got "restructured," so life has gotten a little crazy. I'll still be replying to PMs and following through with any sales/group buys that I still have going on, but I won't be as active in the forums for a while. I definitely like them way more than regular blues but can't say I like them better than my ergo clears yet. I still have to try the whites I have. I'm gonna throw them in my QFR once I get a day off. Is there such a thing as Jailhouse whites? Page created in 0.482 seconds with 202 queries.